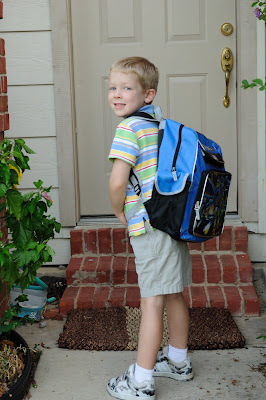 First Day of Kindergarten. I can't believe I'm even writing that! 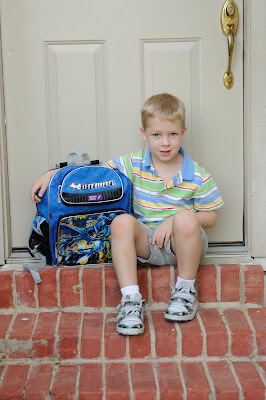 How can my little baby boy be in Kindergarten already? Nicholas has been very excited about this new adventure. He got to pick out lots of new school supplies and even a cool new Batman backpack. 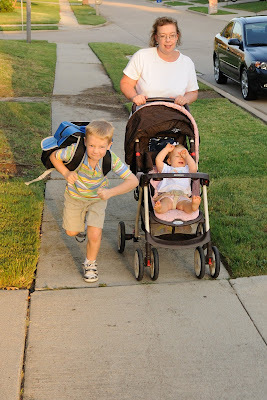 Stuart took the day off of work so he could be with us as we walked Nicholas to school and picked him up this afternoon. 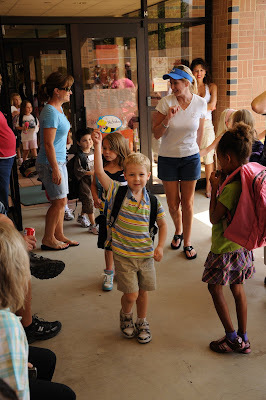 Nicholas was charging down the street anxious to get in his new classroom and makes lots of new friends. 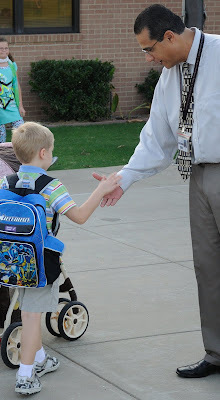 Nicholas met the Vice Principal outside the school's front door. I hope he doesn't have many more encounters with him this year! 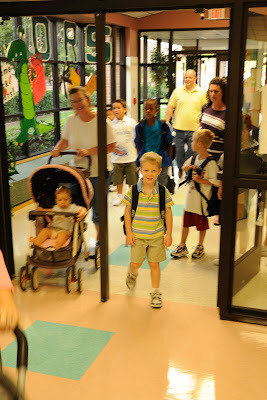 I like this picture of Nicholas walking into his school for the first time. He was beaming from ear to ear. He felt like such a big boy! 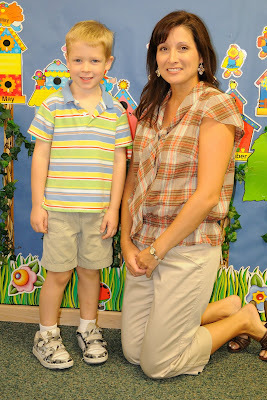 Here is Nicholas with his teacher. He seems to like her. He was very excited to see that she had a full set of books from the Magic Tree House series. They instantly struck up a conversation about Jack and Annie and all of their wonderful adventures. 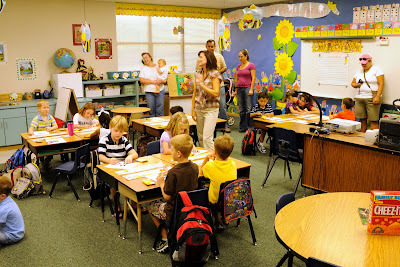 Here is Nicholas' classroom. I like it, especially since the teacher had Pachebel Canon playing in the room this morning. It is a colorful room but not too busy. There are a lot of hands-on activites all around. There are only 15 students in the class which is much better than I was expecting. As you can see most of the parents were lolly-gagging around with their cameras in hand watching their little ones grow up before their eyes. I got teary-eyed a few times in the classroom but, believe it or not, I DID NOT cry! I think it really helped that Nicholas was so excited about his new class. 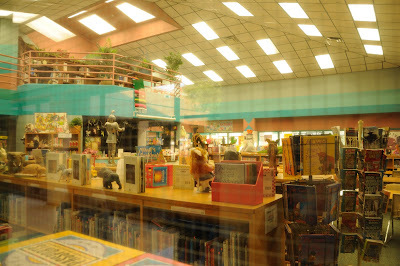 I caught a glimpse into the library as we were leaving. Click on the picture to get a better view through the window. So many books! I would love to go read them all myself! I especially love the little book balcony upstairs. How fun! Stuart, Rachel, and I were a little sad as we walked home without our little guy with us. It's about a 10 minute walk and I plan to walk Nicholas back and forth to school but he will probably also ride his bike as I walk with him. We just need to get a bike lock for it so he can park his bike at school during the day. We got home and Stuart and I sat on the couch while Rachel stood on the floor holding on to the edge of the couch. We talked a bit and then Rachel got a little too brave. She held on to the couch with one hand and tried to reach over for the coffee table with the other hand. Silly girl forgot that she can't walk yet and went face first into the edge of the coffee table. Lots of crying, lots of blood, and a trip to the pediatrician. She tore her frenulum, the little piece of skin that attached her upper lip to her gums. The pediatrician said that it isn't a big deal and that 90% of children tear that before they turn 10 years old. 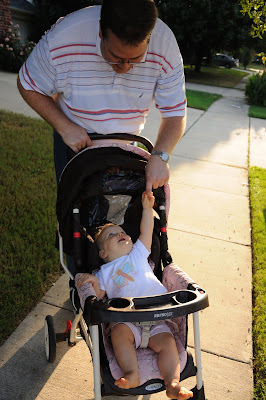 Our little over-achiever accomplished this milestone at only 10 months old! She also has a new tooth coming in on the top and we think it hit the one tooth she already has on the bottom because there was some blood and swelling around the new tooth. The doc felt the tooth and gums and said everything seemed fine. He said the tooth was very protected since most of it was still up in the gums. The only treatment is Tylenol for pain and avoiding some acidic foods that might sting a little. She is still a little fussy but she napped well this afternoon since she spent her morning nap time at the doctor's office. 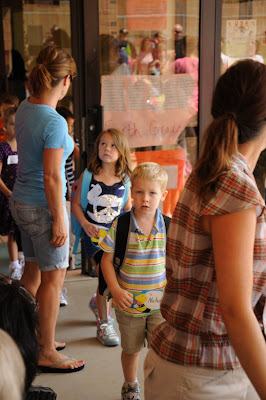 We were outside the door of the schoool when Nicholas got out this afternoon. I love this set of pictures. First he looked a little overwhelmed - where do I go? where are my parents? what am I supposed to do? But then he sees us and smiles big and proud while he holds up his name tag to let his teacher know that his parents are here to pick him up. 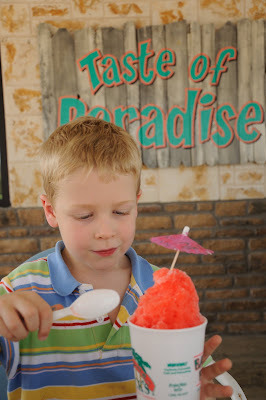 We took Nicholas to get a sno-cone after school. He got cotton candy flavor. 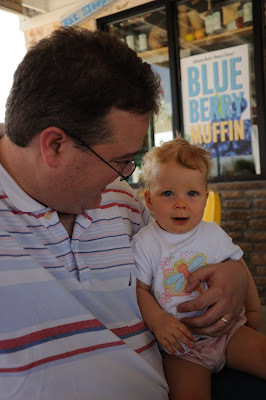 We also got a baby sno-cone for Rachel with vanilla flavor. I was hoping that the cool ice would feel good on her boo-boo. But she wasn't interested in it at all so she just sat happily on Daddy's lap. What a day! Exciting for Nicholas. A little sad (and stressful!) for Mom and Dad. Hopefully tomorrow will be better - and a little less eventful. You know what I thought about this whole day? What a blessing it is that Stuart could take off work to be with you guys! One, to see Nicholas' special day, but two, so that you guys could be together for Rachel's boo-boo!